And they'll cater for everyone. Drink (responsibly) and be merry. Alas, the silly season continues. As New Years Eve draws closer, you may be looking forward to a social do at yours -- on account of your perfectly located apartment with splendid vistas, or your general aversion to stepping outside the comfort of your own home (we're with you). Despite said aversion, there's something to be said about popping a cork and celebrating new beginnings with your nearest and dearest. And by popping a cork, we mean treating yourself to a couple of these crafty cocktails (or mocktails). They're much more than your usual glass of champers that, on its own, can often leave you feeling a little bloated (not an ideal way to bring on 2017). Plus, there's enough to suit any a crowd. So put down your vintage bottle of Bolly, stack up on some party ingredients and get mixin'. (Whilst you're at it, have a read of our ways to enjoy yourself and stay healthy this silly season). Okay, we know what we said about the ol' champers. If you're not one to stray far from what you love, however, a few additions can go a long way. Here's another. Watch that pomegranate fuse until your heart's content. It's called the French 75. And this will turn any social do into a stunning French soiree. 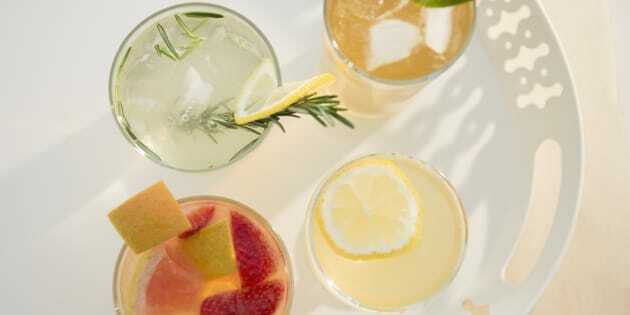 Mix up the cognac, lemon juice and syrup in a cocktail shaker, top with champers and serve with a lemon twist. There's a ritual at nightfall aside a canal in Venice. And it has something to do with uttering the word 'Spritz'. Over here in Oz, this Italian aperitif has taken off and has come to resemble a stunning summer drink in varying forms. And why not? It's lightly alcoholic, refreshing and aromatic. Put a few ice cubes (no more than three or the Spritz will be watery) in a white wine glass or goblet. Add the Aperol and the Prosecco or white wine, a couple of splashes of soda water and the halved orange slice. Stir quickly. Keen to steer clear of champers and hold the sugary cocktails? Vodka, gin and tequila on the rocks are all good places to start. Add a touch of new year zing with this Grapefruit and Gin Fizz. Because sober does not equal boring. Even on New Year's Eve. You won't even know the difference.